Anxious Alvy pretends to be happy. Failure is sometimes more a state of mind than an actual physical fact. Sadly, thinking you're a failure can be far more difficult to overcome than actually being one. 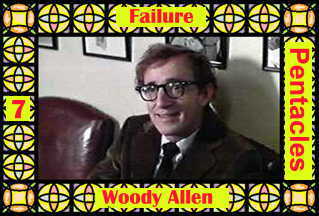 The typical Woody Allen movie character views himself as a loser, and agonizes over it. He usually has a decent job, and friends, and family; is smart and funny and even has girlfriends. But he just can't get over being a failure.